A coronary angioplasty, also called a balloon angioplasty, can be used to restore the circulation of oxygen-rich blood to your heart. This is a common procedure indicated when one or more coronary arteries are narrowed by a waxy substance known as plaque – a condition known as atherosclerosis. Left untreated, these plaques can rupture and lead to complete blockage, and ultimately, a heart attack. A coronary angioplasty can be performed as a preventative measure, or as an emergency procedure to open an artery during a heart attack. Before the procedure begins, the patient will be sedated for comfort. General anesthesia is not employed for this procedure. The surgeon will decide whether to access the circulatory system via an artery in the leg, which is most common, or from the arm. A tiny guidewire is threaded though the artery in the arm or leg and into the heart. A cardiac catheter is then inserted and follows the guidewire to the heart. Fluoroscopy, or continuous X-ray, is used to visualize the placement of the catheter and the progression of the procedure. The catheter is first used to deploy contrast dye into the blocked artery to determine exactly where the blockage is located. Once the precise location is found, a guidewire delivers an uninflated balloon to the blockage site. 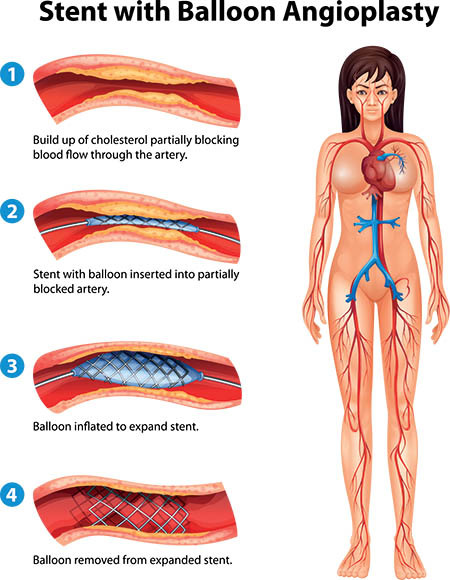 The balloon expands, pushing on the plaque to widen the artery and improve blood flow. The balloon is then deflated and removed. Oftentimes, a stent, much like a wire scaffold, is placed in the newly treated area to prop the artery open. The entire procedure will last between 30 minutes and a few hours depending on complexity. Patients will be monitored for chest pain and excess bleeding for several hours after the procedure. Depending on the progression of recovery, the patient may be able to leave on the same day, while some will have to stay in the hospital for one night. More common risks of the procedure can include the re-narrowing of the artery when a stent is not placed or a blood clot forming at the site of the stent. The risk of the latter can be mitigated with appropriate anticoagulant medication. Bleeding at the catheter insertion site may also occur. Much more rarely, heart attack, stroke, kidney problems and arrhythmia may occur. These risks will be fully discussed during consultation.